COLUMBUS, Ohio — Retailer Stuart Hunter, owner of four Roll: Bicycle Company locations, is making the move to online retail with his new custom bike program. The bike model is called the 1:Bike, and was recently launched on Kickstarter. 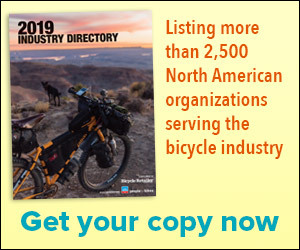 SQUAMISH, British Columbia (BRAIN) — Kona Bicycles will roll out its online sales program in select U.S. states later this year. REDMOND, Wash. (BRAIN) — Dennis Estrin, who founded Redmond Cycle in 1968 with his wife Marie, passed away on June 17 from complications of Lou Gehrig's disease. He had recently celebrated his 80th birthday. SAN CLEMENTE, Calif. (BRAIN) — For the past three years, Matt Wenger and John Russell, who direct the popular midweek Over the Hump race series in Southern California, have thought about hosting a ‘non-number plate’ event in Orange County. PARK CITY, Utah (BRAIN) — Wake, caffeinate, eat, meet, eat, ride, eat, socialize...repeat in a spectacular setting. It's a little like Groundhog Day, of the best kind. Summer PressCamp Day Two: The year of the 29er? PARK CITY, Utah (BRAIN) — If it takes three occurrences to call it a trend, it seems safe to say 29ers are making a comeback in 2017 product lines. PARK CITY, Utah (BRAIN) — The eighth annual Summer PressCamp kicked off Tuesday at Park City's scenic Deer Valley Resort under sunny skies, and for the first time, Outdoor PressCamp is running concurrently at the Deer Valley Lodge next door. LEOMINSTER, Mass. (BRAIN) — When the only bike shop in Leominster, Gear Works Cyclery, closed in March, Nate Jones decided it was finally time to open his own store. KAILUA, Hawaii (BRAIN) — The Bike Shop has moved its store in Kailua three blocks south to a more spacious and visible location. The retailer, which also operates stores in Honolulu and Aiea, has served Oahu since 1970 and Kailua since 1987. NAPA, Calif. (BRAIN) — When Brad Dropping, owner of Napa Valley Bicycle Tours, learned that a section of Napa Valley’s first separated bike path would open this summer, he began looking for a space for another location.